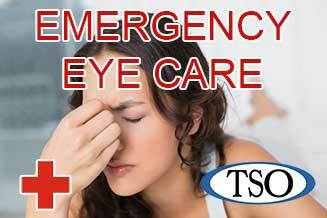 Please walk-in to TSO Katy Fry with red eyes, pink eye, or scratched eyes for immediate attention in Katy, TX. 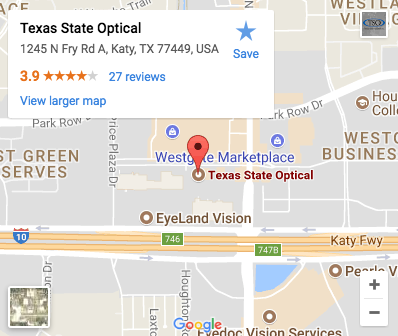 Welcome to the online office of the Fry Road Texas State Optical in Katy, Texas. We are pleased you want to learn more about our Katy Eye Doctor’s practice! At Texas State Optical, the family Optometrists combine the latest technology and years of experience to give you thorough eye exams and fashionable, affordable eyewear. Our eye doctors and the eye care team know what you’re looking for and are eager to help you see and be your best. 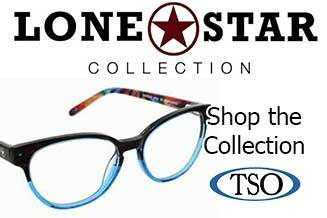 Texas State Optical has been “taking care of the eyes of Texas since 1936”. Dr. Lori Shulman is proud to be part of the TSO family, which emphasizes patient-focused care and quality products that stand the test of time. Thia place was great. Walked in for my appointment and they were ready. Roxy did a great job of making me feel comfortable while explaining everything so that I knew what was going on. Next I saw Dr. Shulman. She was amazing and took her time to make sure everything was being done right. 10/10 would recomend. Great experience. Great service, the Doctor provided excellent service and on a SUNDAY! HIGHLY Recommend this TSO location! Great customer service....entire staff very friendly and helpful!!!! I am not one to write reviews at all....I just wanted to say how impressed I was with this location. I walked in to see if my glasses could be repaired. Nothing major, but to me it was. I did not purchase here and they treated me so kind. Both Kim's that work here are great!!! I saw how they managed the phones and it was just the 2 of them and they never seemed rushed or made me feel rushed. They asked if I needed anything else and gave me a business card and I will for sure be back to purchase my next glasses here. Thank you for being so kind regardless of where I purchased my glasses. My eye exam was great from the start . Doctor Shulman was very nice and Alexa Garcia did a great job fitting me for my perfect glasses. I will definitely be back. Staff is super nice and friendly, really knowledgeable about what type of glasses to get and even helped me with staying within a good budget for glasses and contacts. I even got a free pair of sunglasses. Dr. Lori Shulman is the best, takes her time with you, makes sure she takes care of any questions/concerns and makes you feel really comfortable especially with kids. Conveniently located on 1245 N Fry Rd in Katy, TX, the TSO Katy Fry office is open six days a week. Call us to make an appointment with our Eye Doctors to talk about your eyeglasses, contact lenses or specialty lens needs. 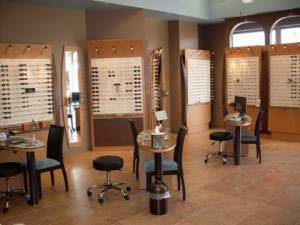 Please feel free to drop in anytime to browse through our large selection of designer eyeglass frames or sunglasses. 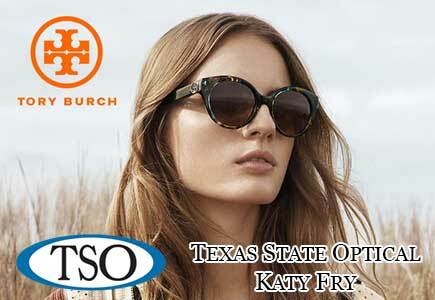 TSO Katy Fry is proud to serve the Katy area. Our purpose is to serve you and help you see the important things in life. We are easily accessible for the residents of: Mission Bend, Westchase, Royal Oaks, Memorial, Katy and Cinco Ranch, Texas. 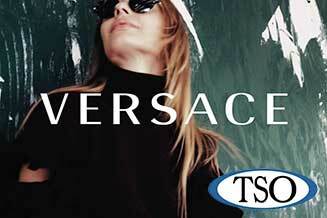 TSO carries a wide range of designer eyewear as well as budget-friendly frames and all kinds of contact lenses. Our Optical is fully stocked with eyeglasses ready for your prescription, and our Opticians have a great sense of style, as well as knowledge about glasses and contacts. We are looking forward to seeing you at our North Fry Road Texas State Optical in Katy. Walk in, or book an appointment today! Watch Dr. Lori Shulman Answers Your Eye Care Questions! As we reach middle age, particularly after age 40, it is common to start to experience difficulty with reading and performing other tasks that require near vision. This is because, with age, the lens of our eye becomes increasingly inflexible, making it harder to focus on close objects. This condition is called presbyopia and eventually, it happens to everyone who reaches old age to some extent.